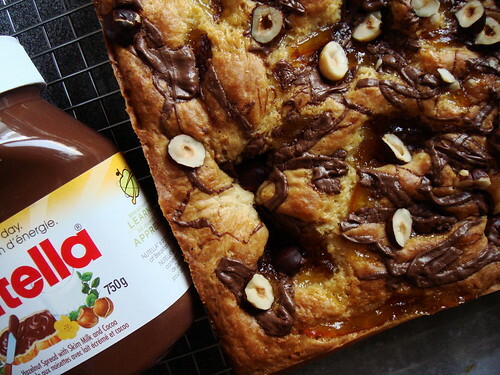 It is my tradition to celebrate World Nutella Day by creating a dessert made with the popular hazelnut cocoa spread. This year is no exception. My inspiration comes from yeast leavened kuchens (cakes) I learned to make in the last year. 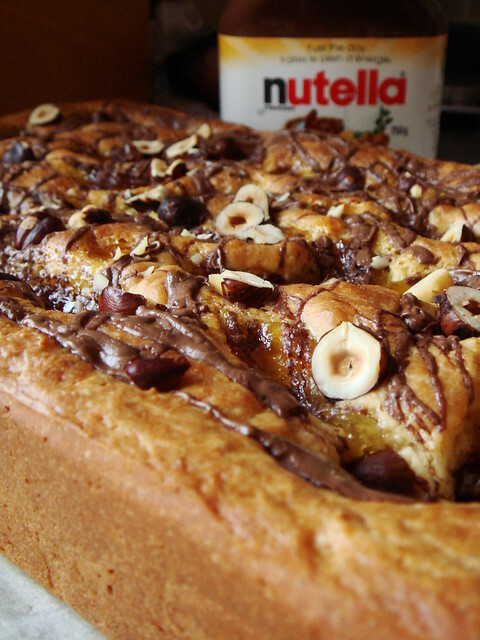 I wanted to top the airy buttery cake with dollops of Nutella but it could use a supporting flavour. Then I remembered making marmalade Nutella tartine from Dorie Greenspan’s Around My French Table. The citrus marmalade added an unexpected layer of sweet, tart, and bitter note to the rich hazelnut taste. I loved the tartine so much it was on my breakfast table for over a month. Why bother with toast if I can incorporate Nutella and marmalade to an yeasty, eggy, buttery base right from the start? 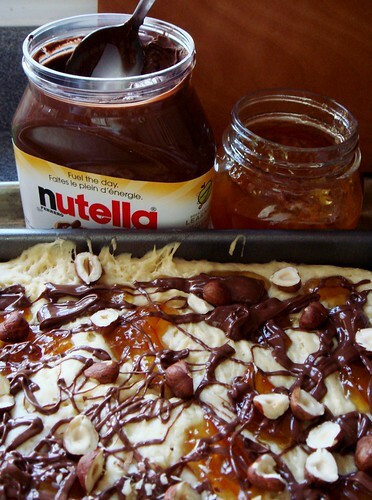 Nutella Kuchen with Seville Orange Marmalade is my answer. 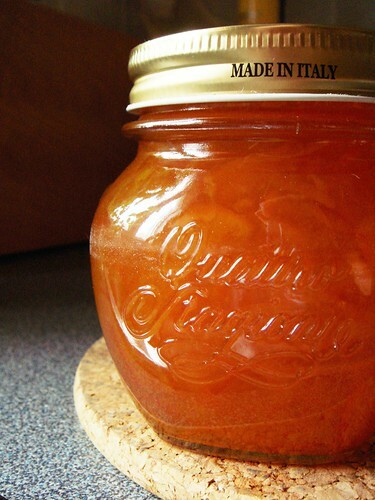 I opened a jar of my own homemade marmalade with shreds of candied orange peel and Cognac. Just looking at the bright orange colour chases my winter blues away. The cake was sprinkled with toasted chopped hazelnuts for a bit of crunch. What a decadent breakfast treat! I started baking my kuchen this morning before I took a shower. When I came downstairs, my house was filled with that delicious aroma you remember from good bakeries. It was a heady mix of yeast and butter laced with toasty hazelnuts. Who could possibly resist? I immediately sliced my kuchen for a piece. Do you notice that light airy texture? That is the seductive power of a yeast leavened cake. 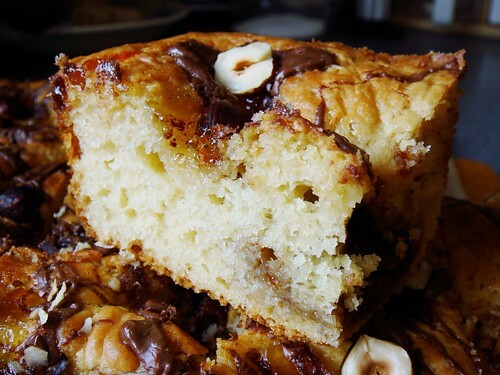 The cake dimpled under the weight of random dollops of Nutella and marmalade. Golden patches winked at me between shots of sweetness. The rustic appearance of this kuchen fit appropriately with the simplicity of the recipe. Many home bakers are wary of working with yeast. Oh, please don’t because you would be missing out! Making this kuchen is so ridiculously easy, you don’t even need a mixer. I like to stir together the batter before I go to bed and let it rise in the fridge overnight. When I wake up in the morning, it would already risen to great heights and ready for the oven. 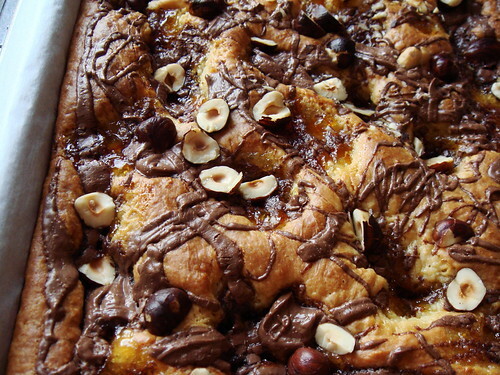 Trust me, there are few breakfast treats better than freshly baked Nutella Kuchen with Seville Orange Marmalade! Big thank you to Ms Adventures in Italy and Bleeding Espresso for hosting another year of Nutella celebration! Line a 9x13 inch cake pan with parchment. In a small sauce pan, scald whole milk with brown sugar. Remove from heat and stir in butter until melted. If you have a digital thermometer, cool milk mixture until it reads 100-105F. Otherwise, you want your mixture warm to touch. Sprinkle in yeast and let it sit for 5 to 10 minutes until bubbly. In the mean time, stir together eggs and hazelnut extract (if you’re using) in a small bowl. In a large mixing bowl, whisk together flour and salt. Using a rubber spatula, beat milk mixture and eggs into flour until batter is smooth. Fill your prepared pan with batter, spread evenly, and cover with plastic wrap. At this point, you can put the pan in the fridge for up to 8 hours or room temperature for about an hour. The batter is ready when it has risen to almost the top of the cake pan. Warm the marmalade and Nutella in separate bowls for about 30 seconds on high in the microwave. They ought to be fluid but still thick. Remove plastic wrap from cake pan and gently dollop marmalade over the top of the batter. Drizzle on Nutella. Sprinkle with chopped hazelnuts. Bake kuchen for 30 minutes. Turn down the heat to 325F, rotate pan, and bake for another 15 minutes until top is golden and cake started to pull away from sides of pan. Cool on wire rack for about 10 minutes. With the help of the parchment paper, gently lift the cake out of the pan and continue to cool on the wire rack. Cut into 12-18 pieces and serve warm.